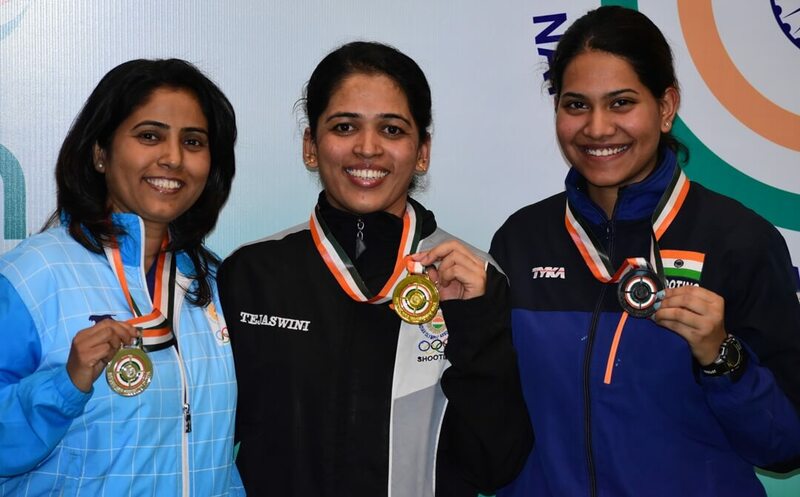 Former World Champion Tejaswini Sawant won the gold in the Women’s 50m Rifle Prone at the 11th Sardar Sajjan Singh Sethi Masters Shooting Championship in New Delhi, on Sunday. The 36-year-old from Maharashtra shot a score of 621.9 to win the title at the Dr. Karni Singh Shooting Range. 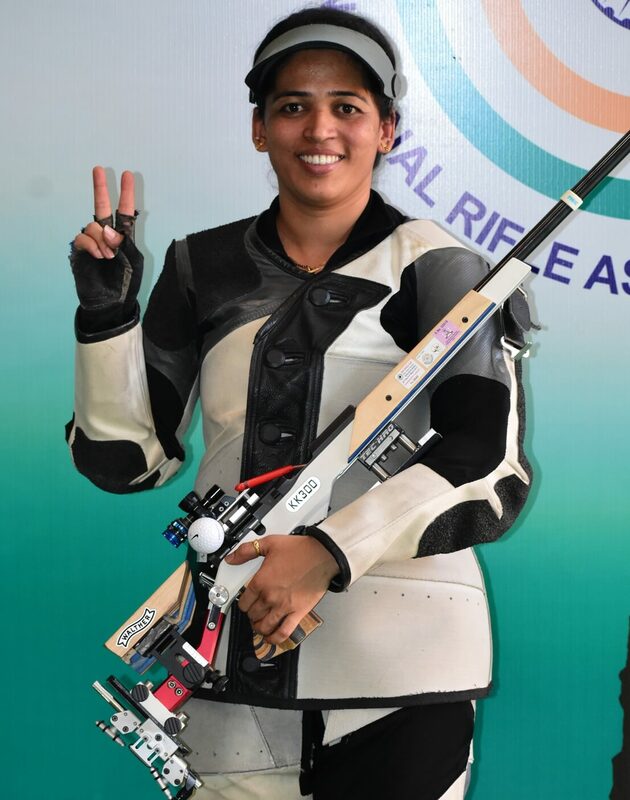 The silver was won by veteran shooter Kuheli Gangulee with a score of 619.0 while Delhi based promising youngster Aditi Singh shot 617.0 to win the bronze. In the junior category, KU Priya, representing the National Cadet Corps (NCC) won the gold with a score of 616.1. In the Men’s 50m Rifle Prone, Navy’s Rahul Poonia pipped Olympian Sanjeev Rajput by 2.1 points to clinch the gold. The current national champion Sushil Ghaley of Army took the bronze. In the junior section, V. Sarvesh Swaroop Shankar of Tamil Nadu won the gold 2.9 points ahead of Qamroosh Meraj, after having topped the qualification earlier. In Men’s 25m Rapid Fire Pistol, Neeraj Kumar who had made the final at the ISSF World Cup recently at the same venue, beat Olympian Gurpreet Singh by two points. Anish won the bronze after having clinched the junior gold. Women’s 50m Rifle Prone: 1. Tejaswini Sawant 621.9; 2. Kuheli Gangulee 619.0; 3. Aditi Singh 617.0. Junior’s Women’s 50m Rifle Prone: 1. KU Priya 616.1; 2. Prasiddhi 614.5; 3. Ayushi Podder 610.3. Men’s 50m Rifle Prone: 1. Rahul Poonia 249.9 (620.4); 2. Sanjeev Rajput 247.8 (623.2); 3. Sushil Ghaley 226.9 (618.8). Junior Men’s 50m Rifle Prone: 1. V. Sarvesh Swaroop Shankar 246.6 (616.1); 2. Qamroosh Meraj 243.7 (608.8); 3. Niraj Kumar 222.9 (606.2). Men’s 25m Rapid Fire Pistol: 1. Neeraj Kumar 28 (580); 2. Gurpreet Singh 26 (576); 3. Anish 21 (569). Junior Men’s 25m Rapid Fire Pistol: 1. Anish 22 (569); 2. Adarsh Singh 20 (558); 3. Thomas George 17 (548).